Over the Christmas holidays I discovered a new series and have been reading through them one after the other. This is the Markham Sisters series by Diana Xarissa, who also does the Aunt Bessie (An Isle of Man Cozy Mystery) series. The Markham sisters are two retired teachers who spend their little inheritance windfall on a bed & breakfast in what they think will be a calm little English village. Which it is, for the most part; the locals do their best to make the sisters welcome. The constable drops in often just to check on them—and is easily persuaded to stay for a bite to eat, seeing what a great cook Joan is. Owning a bed & breakfast has been Joan’s dream since she was young, and since she’s the older, she’s persuaded younger sister Janet to go along with the plan. But running a business and dealing with customers sometimes proves intriguing. Joan has a stronger sense of propriety — which means “no snooping.” It’s Janet who gets quite curious about people who are acting suspiciously or whose stories don’t add up. Joan tells her to mind her own business, but Janet can’t resist doing some investigating. This series is quite tame, more along the lines of Nancy Drew mysteries. Just what I like: no dead bodies discovered, but smaller crimes like art fraud, an odd shortage of narcotics at the drug store, counterfeit money being passed, and people who aren’t who they claim to be. 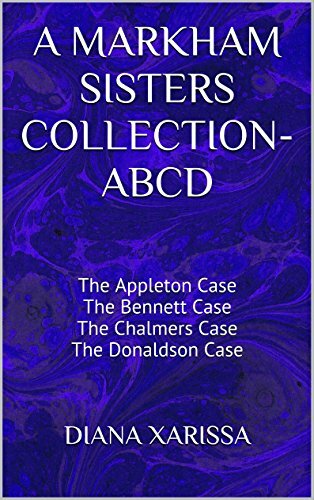 The novel “cases” are named alphabetically and each book is a short, easy read. There is a certain “ghost” angle written into these tales that, for my part, could have been left out. In the stories I’ve read so far it’s only been references to sounds Janet hears and occasionally a strange wind slamming a door. Writing, as we all know can be fraught with hazards. There are PLOT HOLES and SAGGING MIDDLES. Our CHARACTERS may lack depth or interest. A reader may give us a BAD REVIEW even when we’ve done our best. that keep us from getting our message across. Edit #1: a person (in this case the man) is always a who. Roddy has a little monkey and he loves to climb trees. He calls him Timbucktu but he has a bad habit: he never comes when he’s called. When he’s being really stubborn he offers him a banana and he usually comes right away and grabs it. I was happy to see that by the third book Mr Barnett, or his editor, had caught on to this problem and cleared up most of the confusion. We watched the avocets poking around in the pond with their long beaks through our binoculars. Driving by in the car, the falling snow sifted down onto the shrubs around the abandoned house. WHAT BRINGS THIS TOPIC TO MIND? A Way With Words: A Light-hearted Look at the Agony of Writing. I really enjoyed reading it, though it may be out of print and unavailable now. Then there’s the famous one about Yogi Berra…a line that has been picked up by more than one gag writer since its original appearance. Not long ago I got a list of several new books; among them was a blurb for a new cozy mystery. I read it and thought, “This sounds just like the write-up for dozens of other books I’ve seen.” I have to think of Mom’s comment about ceramics. The decorations change: names and professions vary; relationship to the detective and to the victim varies. Otherwise the blurbs are interchangeable. _______ buried/floating/scrunched, in/at/on/into a ________. before Detective ______ (name) a drop-dead gorgeous hunk/ grouchy bumbling misogynist arrests ___________ her/her BFF/her ex/her new boyfriend for the crime. Our MC knows the detective’s set his sights on an innocent party, but someone has done it. So she must become an amateur sleuth (if she isn’t already) and find the guilty one before her efforts make her the criminal’s next target. Like Mom with her preference for pottery over ceramics, I’m one who doesn’t care much for plots all coming from the same mold. I like originality. I like stories with believable characters living their lives, where the crime (or romance) isn’t the be-all and end-all, the only focus of the main character. Where she has some life apart from interrogating suspects and ogling the hunky cop or irritating the grouchy one. Another thing I applaud is a story with team work, rather than a one-woman show. And I dislike an amateur sleuth belligerently demanding answers from suspects — because it’s not believable. In real life people are going to clam up or blow up when pushed like that. Having suspects tell all under pressure may save a serious investigation, but it’s cheap melodrama; a writer sacrifices credibility. That said, I plan to review some books I’ve read where the main characters lead interesting lives, that happen to include a mystery, a romance, or both. I’d like to lift out some writers who, I feel, know their craft and avoid the stereotypes. Recently dumped by her finace, Dana has inherited a cupcake cafe from her deceased Grandmother. She’s moving back to Berry Cove, Ontario, intending to turn this cafe into a profitable business again. We read very often in the first couple of chapters how the business was going under and Dana has to make a profit or lose her life savings. Readers are also told quite often how much she misses her grandmother. Most of this could be deleted or switched to the “show, don’t tell” technique. — Dana couldn’t read any further. Heat rushed to her chest. — “It’s not true,” Inga added with her thick Russian accent rolling her R, yet again. — She noticed the detective glancing at her neck when she swallowed. He probably thought she was guilty of sin. Which, of course, she wasn’t. No where even close. — Her eyes were wide and her jaw fell open as she looked at Brad slumped over on his desk, a cup of coffee turned over, spilling on the side of the desk, and a half-eaten strawberry cream cupcake topped with a high frosting with a spoon dug into it from the Cozy Cupcakes Café right there by his left hand. — But Katie had been such a darling sweetheart seeing how Dana had been pulling all-nighters just as she’d done back in college, getting the disastrous bookkeeping records straight that had been neglected since Nans passed away by her elderly accountant who had started to have trouble with his memory, locating receipts and his failing eyesight. Poor thing. I did finish the story, but this isn’t what I’d call a reader-friendly mystery. Instead of clues being introduced so readers can try their hand at divining whodunit, in the last chapter Dana informs the suspect that she’s gone online and learned points of his/her personal history. She then rattles off a bunch of incriminating info and makes the accusation. Rather a letdown for the reader. The potential is there for a good story, but there are too many flaws in the telling of it, IMO. Dana could be a more sensible, likeable character. She doesn’t come off as the type to manage a business, IMO. A seasoned editor could have improved this book A LOT. However, the writer has some real fans judging by the Amazon reviews — AND she’s achieved her dream of getting a cozy mystery series written. As long as you don’t keep repeating the same mistakes over and over, practice should make perfect.